Knowing how to couple and uncouple correctly is basic to safe operation of doubles and triples. Wrong coupling and uncoupling can be very dangerous. Coupling and uncoupling steps for doubles and triples are listed below. Secure Second (Rear) Trailer. If the second trailer doesn’t have spring brakes, drive the tractor close to the trailer, connect the emergency line, charge the trailer air tank, and disconnect the emergency line. This will set the trailer emergency brakes (if the slack adjusters are correctly adjusted). Chock the wheels if you have any doubt about the brakes. For the safest handling on the road, the more heavily loaded semitrailer should be in first position behind the tractor. The lighter trailer should be in the rear. A converter gear on a dolly is a coupling device of one or two axles and a fifth wheel by which a semitrailer can be coupled to the rear of a tractor-trailer combination forming a double bottom rig. See Figure 7.1. If the distance is not too great, wheel the dolly into position by hand so it is in line with the kingpin. Move dolly to rear of first semitrailer and couple it to the trailer. Back first semitrailer into position in front of dolly tongue. Test coupling by pulling against pin of the second semitrailer. Connect safety chains, air hoses, and light cords. Charge trailer brakes (push “air supply” knob in), and check for air at rear of second trailer by opening the emergency line shut-off. If air pressure isn’t there, something is wrong and the brakes won’t work. Park rig in a straight line on firm level ground. Apply parking brakes so rig won’t move. Chock wheels of second trailer if it doesn’t have spring brakes. Slowly pull tractor, first semitrailer, and dolly forward to pull dolly out from under rear semitrailer. Release pintle hook on first semi-trailer. Never unlock the pintle hook with the dolly still under the rear trailer. The dolly tow bar may fly up, possibly causing injury, and making it very difficult to re-couple. Couple tractor to first trailer. Use the method already described for coupling tractor-semitrailers. Move converter dolly into position and couple first trailer to second trailer using the method for coupling doubles. Triples rig is now complete. Uncouple third trailer by pulling the dolly out, then unhitching the dolly using the method for uncoupling doubles. Uncouple remainder of rig as you would any double-bottom rig using the method already described. 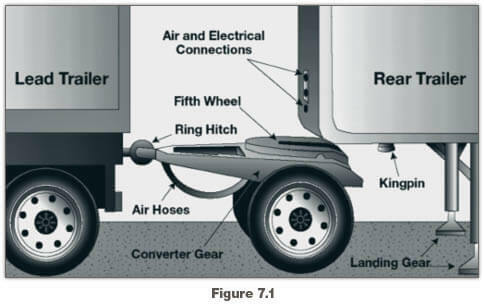 The methods described so far apply to the more common tractor-trailer combinations. However, there are other ways of coupling and uncoupling the many types of truck-trailer and tractor-trailer combinations that are in use. There are too many to cover in this manual. You will need to learn the correct way to couple and uncouple the vehicle(s) you will drive according to the manufacturer and/or owner specifications.